NASA’s Advanced Food Technology Project is exploring how to bring better cuisine to near earth orbit - if not the entire solar system. The AFT project is responsible for providing space flight crews with a food system that is safe, nutritious, and acceptable to the crew, while efficiently balancing appropriate vehicle mass, volume, waste, and food preparation time for exploration missions. This will require a packaged food system with a shelf life of 3 to 5 years – current shuttle and ISS food system technologies do not meet these requirements. Food not only provides nutrition for astronauts, but also enhances the psychological well-being of the crew by establishing a familiar element in an unfamiliar and hostile environment. NASA has awarded a Small Business Innovation Research (SBIR) Phase I contract to Systems and Materials Research Consultancy of Austin, Texas to study the feasibility of using additive manufacturing, better known as 3D printing, for making food in space. Systems and Materials Research Consultancy will conduct a study for the development of a 3D printed food system for long duration space missions. Phase I SBIR proposals are very early stage concepts that may or may not mature into actual systems. This food printing technology may result in a phase II study, which still will be several years from being tested on an actual space flight. 3D printing is just one of the many transformation technologies that NASA is investing in to create the new knowledge and capabilities needed to enable future space missions while benefiting life here on Earth. 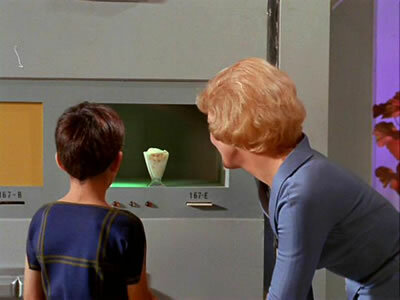 Take a look at my earlier article Fictional Foodstuffs: The Snacks Of Science Fiction for some of the great science-fictional food processors. I'm sure many of you will recognize this iconic scene from a great scifi series from my childhood.